Please help us celebrate the lives and civic contributions of the newest honorees recognized by the Muncie-Delaware County “Walk of Fame.” The event will be held on Sat., April, 14, 2018, at Heekin Park (corner of Madison St. and Memorial Dr., Muncie, IN). The ceremony will start at 10 a.m. and will be followed by a five-lap walk around the “Walk of Fame.” To participate in the walk, please complete the form found here. All are welcome to participate. The Muncie-Delaware County Walk of Fame is a historical project undertaken by the Martin Luther King, Jr. Dream Team, Muncie Public Library and the City of Muncie. The project is dedicated to residents who worked to advance civil rights and embrace diversity. This project is a tribute to the courage of those who came before and the footsteps in their ancestors followed; it is a testament to the suffering endured to carve out a life in a harsh but free world. While only a fraction of those who people that helped pave the way for the Muncie black community are named, the Walk of Fame is dedicated to all those who rose above and persevered, making the Muncie community a better place for everyone. Beatrice Moten-Foster was born in Selma, Alabama in 1938. She was active in the Civil Rights movement and later achieved many firsts for African-American women in radio, television, and publishing. 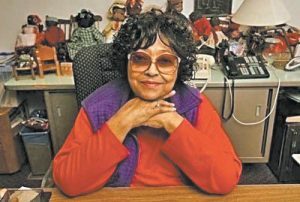 Upon moving to Muncie, she founded The Muncie Times, the area’s only African-American owned newspaper. She promoted education, was a community activist, helped to establish a Muncie Chapter of Indiana Black Expo, helped launch the Muncie Coalition of 100 Black Women, and founded the Martin Luther King, Jr. Dream Team. Dr. Robert O. Foster was born in Muncie, Indiana in 1932. He attended Longfellow Elementary School and earned a Master’s and Doctorate degree from Ball State University. In 1956, he was appointed principal of Longfellow, the first African-American to serve as a school principal in Muncie’s history. He was a community activist involved in diversity and poverty issues. He oversaw BSU’s Diversity Program and established BSU’s Minority House. “Miss Bea” and Dr. Foster passed away within weeks of each other in 2011. It is with great pride and gratitude that the MLK Dream Team adds a marker to the Walk of Fame in their honor. Harvey Thomas (1884-1931) and Pennie Maxine Thomas (1925-1998): Harvey and Pennie Thomas were natives of Cairo, Illinois. Harvey graduated from Tuskegee Institute and was valedictorian of his class. He served as a captain in WWII. Pennie was a graduate of Harris-Stowe Teachers College in St. Louis. Harvey and Pennie established a dental practice in Muncie after Harvey earned his Doctorate of Dentistry in 1952. Pennie earned her master’s degree from Ball State University. Very Important Volunteer Award (VIVA) for Lifetime Achievement in 1997. William “W.T.” Stokes (1858-n.d.): Stokes was a blacksmith who became the first Black police officer for the City of Muncie in November of 1899. William “Wick” Adams (1874-1948): Adams became one of Muncie’s first Black firemen in 1896. Cornilius (Conny) Connell (1913-1998): A talented musician, Connell attended Juilliard School of Music and toured with Billie Holiday, John Coltrane and Charlie Parker. He later moved to Muncie and wrote, arranged, performed, and taught music. James Edwards (1918-1970): Edwards was a pioneering actor who paved the way for other Black actors by performing roles that challenged Hollywood stereotypes. His movie credits include The Set-Up, Home of the Brave, and Patton. Ball Brothers Glass Manufacturing Factory: When a fire destroyed the Ball Brothers Glass Manufacturing Factory in Buffalo, New York in 1887, the firm relocated to Muncie to take advantage of the natural gas boom in the Midwest. The company provided jobs for many Muncie citizens regardless of color. The Ball family and funded Ball State University and Ball Memorial Hospital. Organized Labor: Muncie’s Black barbers formed their own union in 1890. In 1938, Blacks were first admitted to an organized labor union – – Local 489 at Delco Remy Battery Division. 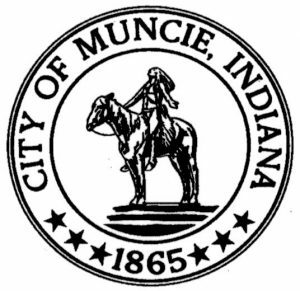 Poor People’s Party: In 1971, the Poor People’s Party of Muncie was formed as the first Black political party in Muncie. This group gave Muncie’s Black community a new and powerful voice in local politics. Roy Buley (1915-1980): Buley, Executive Director of the Madison Street Colored YMCA, also served as one of the first Boy Scout leaders in the Black community. In 1956, Buley and several young people protested the segregation of Muncie’s Tuhey Pool. As a result, the city opened the pool for use by all citizens. Vivian Conley (1922-1993): Conley enrolled at Ball State University in 1982 at the age of 61. She went on to earn a bachelor’s degree and master’s degree and became a champion of educational achievement for minorities and non-traditional stu(dents. Mark Duane Anderson (1968-2009): Anderson studied drama at Anderson and Ball State Universities. He traveled widely in the U.S. and abroad, acting in stage plays, major motion pictures, HBO productions an teaching theatre workshops to youth. Ivan Paul Broaddus (1918-1995): Broaddus delivered his first sermon at age 7 and became known throughout the Midwest as “The Boy Preacher.” He served as Pastor of Antioch Missionary Baptist Church, chaired Muncie’s Human Rights Commission in the 1970’s, and led the local chapter of the NAACP. 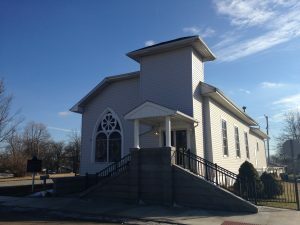 Mary H. Artis (1825-1887): In 1868, Artis and others organized the Bethel A.M.E. Church, the first Black church in Muncie. Garfield and Porter Colored Republican Clubs: In September 1880, the Garfield and Porter Colored Republican Clubs brought prominent orator Frederick Douglass to Muncie. Douglass spoke to a crowd of 3,000 in the Wysor Grand Opera House. Walter Ebert (1910-1990): The desegregation of Ball Memorial Hospital occurred in the early 1950’s under the administration of Walter Ebert. Ebert insisted that all hospital rooms be available for patients regardless of race. Geraldine Evans Findley (1917-2000): Finley, a 1937 graduate of Ball State Teachers College, was the first Black teacher hired by the city school system. She taught at Longfellow Elementary School for 14 years.